Parents Magazine's "Best Book that Champions Kindness" of 2018! This simple yet powerful picture book--from a New York Times bestselling husband-and-wife team--tells the story of one girl who inspires a community to stand up to bullying. 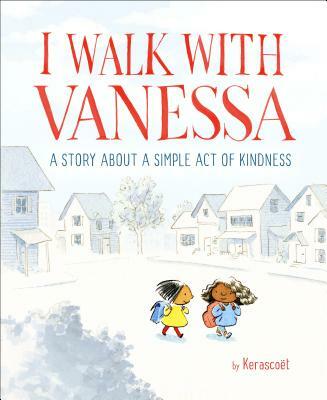 Inspired by real events, I Walk with Vanessa explores the feelings of helplessness and anger that arise in the wake of seeing a classmate treated badly, and shows how a single act of kindness can lead to an entire community joining in to help. By choosing only pictures to tell their story, the creators underscore the idea that someone can be an ally without having to say a word. With themes of acceptance, kindness, and strength in numbers, this timeless and profound feel-good story will resonate with readers young and old. Kerascoët, a husband-and-wife team, are the illustrators of the highly acclaimed graphic novel Beautiful Darkness by Fabie Vehlmann, which was chosen by Publishers Weekly as a 2014 Best Book of the Year, and the New York Times bestselling Jacky Ha-Ha by James Patterson and Chris Grabenstein. Kirkus called Kerascoët's artwork "perfectly delightful" in a starred review of their book Paul and Antoinette. They are also the illustrators of Malala's Magic Pencil by Malala Yousafzai, to be published in fall 2017. Visit them at kerascoet.fr.